GameCity and the National Videogame Archive in the U.K. have announced My Life With Elite, a celebration of the 25th anniversary of the influential space trading game that will include presentations, celebrity appearances and even some origami. 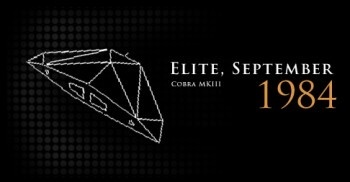 Elite was released in 1984 for the BBC Micro and Acorn Electron personal computers, eventually finding its way to numerous other systems including the Apple II, Commodore 64, Atari ST, IBM PC and even the Nintendo Entertainment System. The game featured advanced three-dimensional wireframe graphics and open-ended gameplay, and is now recognized as one of the most influential games of all time, having a visible impact on everything from Wing Commander: Privateer to EVE Online. Now, in recognition of that influence, comes My Life With Elite, a series of events being held on October 28 as part of the GameCity festival in Nottingham, taking place from Oct. 27-31. The event will be opened by Lord David Puttnam, a politician and film producer, who will talk about the "influence and impact of British creative work throughout the world" over the past quarter-century, after which the National Videogame Archive will introduce the audience to the world of Elite. All the "key players" in the creation of Elite will contribute to the event, including co-creator David Braben, who said, "I look forward to meeting everyone. This should be a fantastic and fun celebration." Of particular interest to fans will be the reconstruction of the "lost origami" models, a series of plans for making paper models of the Elite starships that was intended to be included with the game. That idea ultimately fell through but the original origami artist, Mark Bolitho, is working with GameCity to recreate the designs and offer them to the public, who will be encouraged to make their own Elite ships for inclusion in a hangar-sized "Elite Paper Universe." At the end of the event, sci-fi author Robert Holdstock will read from his novel The Dark Wheel, which was included with the original release of the game, while the Nottingham Trent University Orchestra performs "The Blue Danube" in the background. "I'm delighted to have been invited to attend the Elite day, and look forward to meeting quite a few people who actually made it to Elite status (I was always killed very, very quickly indeed) and to meeting Ian and David again," Holdstock said. "Here's to a fun day!"